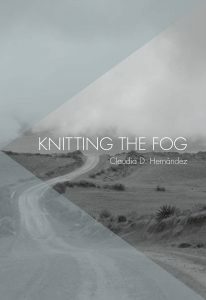 In Knitting the Fog, a poetic accounting of the immigrant experience, the author, as a child, faces daily trials during the three-year absence of a mother illegally making her way to the United States. A series of “coyotes” were employed to ferry her mother from place to place until she reached her destination of El Norte. Her three daughters, Consuelo, Sindy, and Claudia stayed behind, with Sindy acting as a second mother to seven-year-old Claudia. The emotional impact of this absence is deftly rendered through the eyes of Claudia, and the changing landscape. Tactic was mountainous and summer was brief. The constant rain and mist provided an opportunity for Claudia to hone her poetic skills. Claudia preferred Tactic, and she described it as a land of color–in the attire of the residents, pine trees, and parades. Even funerals rang with music, incense, and laughter. Unfortunately, her relationship with Mamatoya was fraught with conflict. In Mayuelas, the environment was harsh and Tiá Soila was poor. She felt loved by her aunt but they were often hungry. Their mother returned three years later, married and ready to bring them to the U.S. The series of “coyotes” accompanying them each step of the way ranged from kind to detached. Three years later they would return to Guatemala to file papers to become legal U.S. residents through the Amnesty Program. They also pieced together the tattered relationships of the past. Mamá learned about her own mother’s suffering (Mamatoya) as the family headed toward a different future. Although this story ultimately ends in the U.S., and the author eventually attains higher education, becoming a poet and writer, my awareness of how her story could have had a different outcome made the book both relevant and heartbreaking. In light of the current misunderstandings surrounding immigrants fleeing violence in Central America, this book should be required reading. The writing is fluid and lyrical and the story is relevant. Claudia D. Hernández has written a book for our times and I am grateful to have read it. Claudia D. Hernández is a poet, editor, translator, photographer, and bilingual educator. She holds an MFA in creative writing from Antioch University in Los Angeles. Her poems and essays have appeared in numerous publications including Berkeley Poetry Review, Southern Humanities Review, La Noria Literary Journal, and Poetry of Resistance: A Multicultural Anthology in Response to Arizona SB 1070, Xenophobia and injustice. Lisa C. Taylor is the author of two collections of short fiction, most recently Impossibly Small Spaces, and four collections of poetry. Her honors include the 2015 Hugo House New Works Fiction Award, and Pushcart nominations in fiction and poetry.